ForceFlex ZB100 gloves from Blackwoods go beyond what is usually expected in hand protection. What sets them apart is the use of ‘Zoombang’ polymer, a special substance which under normal use is soft and fluid-like to the touch, but which will instantly stiffen and lock into a solid state upon vibratory impact or sudden shock. This material is embedded in the palm of the glove and its sheer thickening properties allow the palm pads to stiffen in proportion to the actual amount of energy applied. At rest, the Zoombang polymer simply conforms back to the exact shape of whatever it is supporting. Consequently, this stiffen-andrelax action will dissipate shock and vibration transferred to the body from operating heavy equipment or impact tools and will dramatically reduce fatigue, numbness and pain. 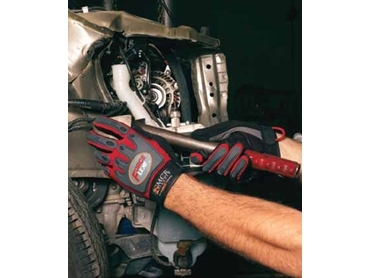 Made by MCR Safety in America and supplied in Australia by Blackwoods, the ForceFlex gloves are ideal for construction work, metal fabricating or in other applications where excessive stress to the hands is a factor. Another notable and more visible feature of the glove is the thermoplastic rubber material on the reverse side, which mirrors the user’s bone structure to protect knuckles and the back of the hand. A pull cord to ease donning the gloves, plus breathable mesh fabric backings, synthetic leather pads, and micro terrycloth perspiration bands are additional features. These gloves won last year’s New Product of the Year Award in the hand protection category at the US National Safety Council Congress and Expo.